What is a no closing cost mortgage? A no closing cost mortgage means you don’t pay for the closing costs associated with getting a mortgage upfront but instead elect to get a slightly higher mortgage rate and receive lender credit to cover closing costs. 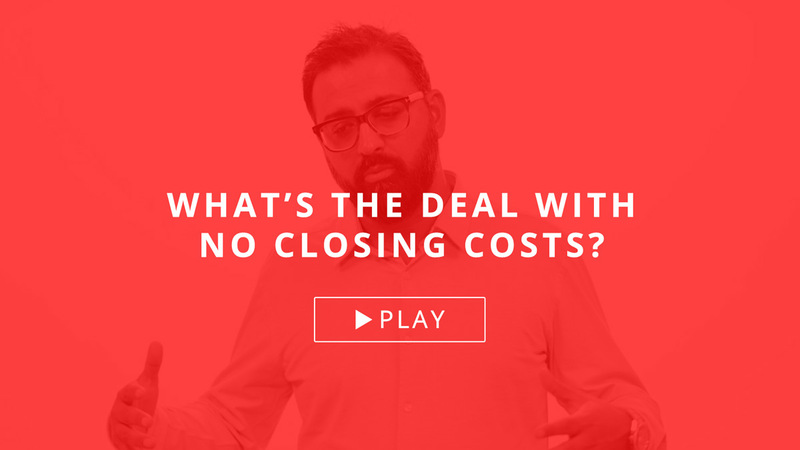 What does no closing cost mean? It simply means that the borrower doesn’t pay for the typical closing costs associated with a mortgage out-of-pocket. Can you buy a house with no closing costs? Yes. You can either have the seller of the house you are purchasing cover all closing costs or contact a low priced mortgage broker to buy a house with no closing costs. Can you roll your closing costs into your mortgage? Only on a refinance home loan. You can only roll the closing costs into a mortgage loan on a refinance transaction. However, you cannot roll the closing costs on a purchase transaction. Who needs a no closing cost mortgage? If you have limited funds and don’t have enough money to pay for the closing costs after the minimum required down-payment, then you should look into a no closing cost mortgage. If you plan on staying in the property for no more that 3-5 years, you should consider a no closing cost mortgage since it takes 3-5 years to recuperate the standard closing costs associated with a mortgage. Can anyone qualify for a no closing cost mortgage? No. Home buyers applying for a conventional mortgage typically need a minimum 700 credit score but, depending on market conditions, those same borrowers may be able to get a no closing costs mortgage with a 680 minimum credit score. Borrowers applying for an FHA loan preferably need a 640 credit score to qualify for a no closing cost loan. However, depending on market conditions, FHA borrowers may qualify with a 620 score. How do I avoid paying closing costs? There are two ways to avoid paying closing costs on a mortgage. You can ask the seller of the property that you are buying to contribute 3% of the purchase price towards your closing costs or pre-paids or contact a mortgage broker that has their compensation level set to no more than 2%. Preferably, your first goal should be to have the seller cover the closing costs so you can receive a lower mortgage rate. What is a FHA no closing cost mortgage? An FHA no closing cost mortgage allows a home buyer to purchase a home with only the required 3.5% down-payment out of pocket. HUD’s upfront funding fee is added to the loan amount and the closing costs are paid using lender credit based on the interest rate that the borrower qualifies for. Can all mortgage companies, such as banks, lenders and mortgage brokers offer a no closing costs mortgage? No. Most mortgage companies set the backend yield on their rates so high that there is not enough credit available from the rate to offer a no closing costs mortgage. For example, the average closing costs and pre-paids associated with buying a home is about 3% of the purchase price. Since the rates typically yield no more than 5% on the backend of the loan there is not enough credit available to cover the closing costs if the lender has set to make 3-5% yield. Thus, only low priced mortgage companies which have set their yield at 2% or lower can do a no closing cost mortgage. A qualified veteran typically can get 100% financing to purchase a home. A no closing cost VA home loan enables the home buyer to receive lender credit to cover all closing costs and pre-paids and get into their home with no money out of pocket. The VA finding fee is added to the loan amount or waived if the veteran has more than 10% disability to be exempt for the VA funding fee. Who offers a no closing cost mortgage? Every mortgage broker that has set their compensation level to no more than a 2% yield can provide a no closing cost mortgage. The only no down payment no closing cost mortgage available in the current market is a VA loan for qualified veterans. All other home buyers applying for a conventional or an FHA loan will need to put the minimum required down payment of 3.5% for FHA loans and 3% for conventional first time home buyers. What is a low closing cost mortgage? A low closing cost mortgage typically refers to a loan with zero lender fees such as no underwriting fees, admin fees, processing fees or discount points. Who can get a no closing cost home loans? Qualified home buyers with a minimum of 640 credit score applying for an FHA loan or a minimum 680 score applying for a conventional loan.